We have recently heard a lot about NEC 2017 and rapid shutdown, how do Tigo’s products comply with specifications NEC 2017? Tigo offers multiple NEC 2017-compliant Rapid Shutdown System options with flexible module-level power electronics (Flex MLPE). Tigo will display two different TS4 System architectures for meeting NEC 2017. The first is the most cost-effective solution with powerline communication featuring Tigo’s Rapid Shutdown System (RSS) Transmitter with TS4-F (Fire Safety). The second is the wireless Rapid Shutdown solution with module-level monitoring featuring the TS4-S (Safety), TS4-O (Optimization), or TS4-L (Long Strings). How does a solar professional best prepare for NEC 2017 690.12? The NEC 2017 article 690.12 update calls for module-level rapid shutdown of solar systems instead of NEC 2014’s array-level shutdown requirement. NEC 2017 went into effect on Jan. 1, 2019 in certain jurisdictions which state that all conductors within an array’s 1ft boundary have to be reduced to 80V or less within 30 seconds of rapid shutdown initiation. As the only UL-certified multivendor Rapid Shutdown solution for string inverters in new and existing installations, Tigo’s MLPE is the sole option for NEC 2017 compliance when installers want to chose which modules and which inverters go into a PV system. What are the different ways to comply for NEC 2017 rapid shutdown (i.e. wireless and PLC)? 1.) TS4-F (Fire Safety) – Fire Safety is a specialized rapid shutdown solution that pairs with an integrated modular junction box base (TS4-F) and retrofit/add-on base (TS4-R-F). Compatible with all SunSpec signaling devices for activation with powerline communication. It includes module-level deactivation and automatic or manual shutdown. This unit is used with Tigo’s RSS Transmitter which is available for single- and three-phase inverters as well as with an outdoor kit or integrated into an inverter. 2.) TS4-S (Safety), TS4-O (Optimization), TS4-L (Long String) - Safety is a wireless rapid shutdown solution that pairs with an integrated modular junction box base (TS4-S), a single retrofit/add-on base (TS4-R-S), or a dual retrofit/add-on base (TS4-R-S-Duo). It includes module-level deactivation and automatic or manual shutdown with monitoring. The TS4-O, TS4-R-O, TS4-R-O-Duo includes all this plus optimization for higher energy yield. The TS4-L includes all this as well as optimization plus 30% longer string design capabilities. Tell us how Tigo is a multivendor rapid shutdown solution? 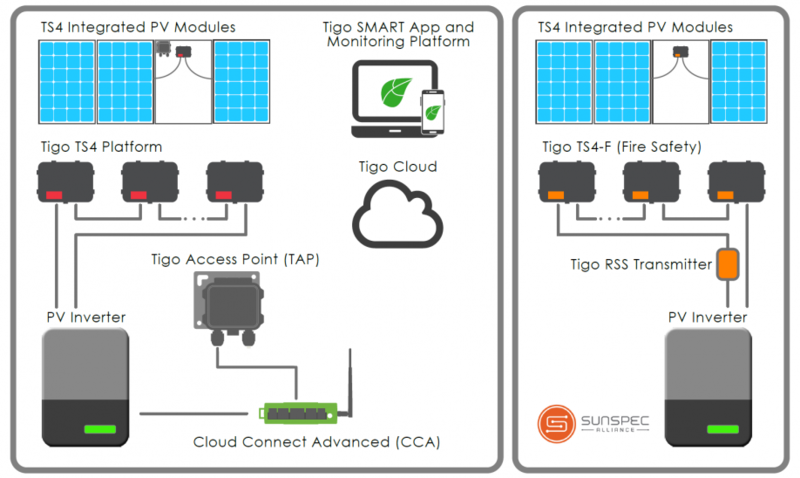 Tigo is the only UL-certified multivendor Rapid Shutdown MLPE solution for residential and C&I rooftop solar installations. Tigo’s TS4 Platform are compatible with more than 40 inverter types and 2000 module types. The TS4 units have been tested in strict standard operational test conditions to safely reduce the voltage of each module and power to each inverter. Select lists have been certified by Underwriters Laboratories (UL) and Nationally Recognized Testing Laboratories (NRTL) for fully complying with NEC 2017. Why do you feel third party certifications are important when it comes to solar safety? Third party certifications are important when it comes to solar safety and codes like rapid shutdown to validate the reliability of equipment. UL, for example, is an internationally recognized electronics-certifying party that can ensure proper operation for installers and solar commissioners. Regulations like rapid shutdown are for the safety of system owners and first responders in case of an emergency, so rigorous testing by a third party proves perfect operational compliance with safety standards. Tell us about MLPE and why it is important when it comes to complying with NEC 2017? MLPE is the best solution for complying with NEC 2017 for multiple reasons. First, MLPE is capable of meeting both NEC 2014 and new NEC 2017 rapid shutdown codes. The NEC 2017 update calls for module-level rapid shutdown of solar systems, instead of NEC 2014’s array-level shutdown requirement. MLPE add-on/retrofit models or module-integrated “smart modules” are ideal because string-level shutdown solutions alone are not sufficient to limit voltage within the 1-ft array boundary. Integrated smart modules reduce installation time for meeting NEC requirements. Plus, with the ability to add functionality such as module-level monitoring to reduce maintenance time and optimization to increase energy yields, MLPE brings the option of adding more features as needed. When installed according to manufacturer guidelines, the standard practice of shutting down AC power to PV systems prior to safety and maintenance activity on PV arrays does not change with MLPE. When MLPE equipment and inverters receive AC power from the same breaker and that breaker is shut down, MLPE drops the outputs of all module leads to ensure the array remains below code-specified voltage limits within 30 seconds. In addition to this automatic shutdown function under AC loss, some MLPE also provide manual activation of rapid shutdown features specifically for maintenance purposes. With the latest NEC compliance, manual and automatic shutdown activation, and additional features, rapid shutdown compliant MLPE can greatly increase peace of mind and ease for safety personnel, solar PV system owners, and installers alike. How do NEC 2017 specifications differ between residential vs. C&I or among states? NEC 2017 article 690.12 is specific to rooftop solar installations and are applicable for both residential and commercial systems. This article does not apply to ground-mount or utility solar installations. According to the NFPA.org NEC adoption site, “As of March 1  28 states have completed its 2017 NEC update process. Ten other states are in the process of revising the statute or administrative rule through which the NEC is updated to reference the 2017 edition. Nine states are using the 2014, 2011 or 2008 of the NEC and are not in the process of updating the edition currently in use.” Some of the NEC 2017 completed states include MA, CT, PA, VA, TX, NM, CO, NV, OR, and more. Some of the NEC 2017 in progress states include CA, NY, FL, NJ, DE, MD, and more. Give us a few tips on how can a solar professional comply with safety regulations like NEC 2017 and still optimize a PV system? Use Tigo’s TS4-O (Optimization) or TS4-L (Long Strings) units on your solar system to get the benefits of both complying with NEC 2017 while also optimizing your PV system. Both these units come integrated with select UL-listed PV modules – or for existing PV systems, you can use the retrofitted TS4-R-O unit. With both these options, you can access monitor module-level monitoring, comply with safety standards, and harvest the most energy.